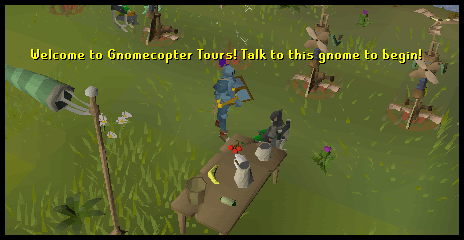 In the field just east of Draynor Manor, two gnomes have created their own business: Gnomecopter Tours! These gnomecopters are available for both free to play and members! Have you ever wanted to journey to unknown members' lands, seeking to know what it looks like? 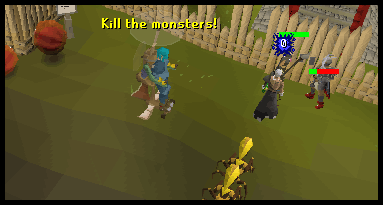 If so, rush to the gnomecopter field, just north of the Lumbridge windmill! 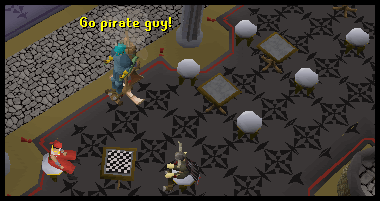 Gnomecopters were removed from the game on 25 March 2009, and no longer exist in RuneScape. This guide exists only as a historical reference. To start the tours of the best members-only content, head immediately over to Gnomecopter Tours just north of the Lumbridge Windmill. It's easy to spot! Just look for wind socks, banners, and those lovely gnomecopters just urging you to rush over and fly on them. Now in order to do anything you must have an overview, also known as a tutorial, of the whole gnomecopter system. To begin this, talk to Hieronymus Avlafrim in the south-eastern corner of the gnomecopter take-off field. While speaking with Hieronymus, you can learn so much - the sky is the limit! You, of course, will pick up a few things. Although Hieronymus doesn't say this, he implies that they stole magic carpets from Al Kharid to build the gnomecopters! What what? Hieronymus won't give you a ticket? What a bummer, eh? No worries, I'm sure Sasquine Huburns can help you solve that problem. Now to ride any sort of transportation system, you obviously need a means of way to show that you can use that method. In order to use gnomecopters, you need a ticket. These tickets are 100% free! Just talk to Sasquine Huburns who is in the middle of the gnomecopter take-off field. Once you select the place where you want to go, Sasquine will give you a ticket and you are ready to take flight! Remember to keep your ticket in your inventory and you've taken off the required clothing! Just head over to those new shiny gnomecopters just waiting to be ridden to take flight. All you have to do is click on it and you will begin flying. Now in order to control your flight you need to know how to operate your flying controls. There are five controls that you need to know. Autopilot - Toggle on/off - When autopilot is off, you can move around like you usually do walking. You still can't go inside though! Alright, you know that you have the ability to run and walk in a real game situation, right? In gnomecopters, you can switch to running mode and you will fly faster. The speed is about the same as a person running. So if you ever feel like it's going kind of slow, turn on your run and speed around the place until your energy is up! As said before, there are six destinations where you can travel to. Now every single player you see on those member only places are fake characters! Do not be confused and think they are real. You may notice that each of them has funny or weird names. So on top of flying around members areas, you get some humor too! 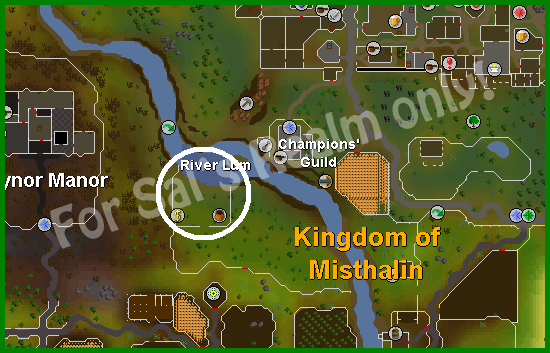 Now in the event that you want to stop flying, select option three (in the above picture) so you can return to Lumbridge. 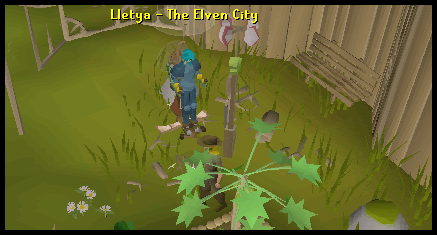 Lletya is an elven city where people go to train and relax. Do you want more information? View the Lletya city guide! An enjoyable members Activity. You can think of it as a game of capture the flag. Do you want more information? 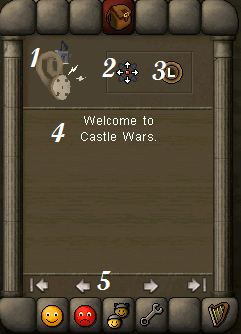 View the Castle Wars Activity guide! Where members train the Hunting skill. Do you want more information? View the Rellekka city guide! A great Activity to train your combat skills! Watch as fake players fight portals and monsters to save the Void Knight! Do you want more information? View the Pest Control Activity guide! This time you get to go indoors! This is an Activity that allows you to play games against other people. Do you want more information? View the Burthorpe Games Room Activity guide! The spooky town in Morytania. You might notice that it's basically swampland. Do you want more information? View the Burgh de Rott city guide! There are many things to do here besides riding the gnomecopters, which eventually can get quite boring. There are some easy ways to train and more! 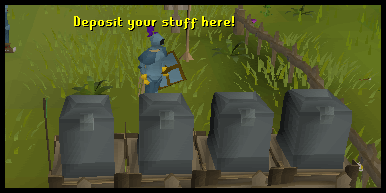 In the west area of the gnomecopter field, there is a bank deposit box. You can't access your RS bank account but you can bank your items. Just south of the gnomecopter field, you can find a place where cows roam just waiting to be killed to get their precious cowhide. Selling cowhides in the Grand Exchange can get you a good sum of money fairly easily. Since the bank is so nearby this will make this process so much easier! There of course is a General Store run by Hieronymus Avlafrim where you can find all your general needs! It's worth noting that this is the only freeplay store in RuneScape that sells Pie Dishes.